A wind-driven brush fire tore through Carlsbad Wednesday, burning dozens of homes, downing power lines and forcing evacuations of thousands of residents, students and tourists at the Legoland amusement park. The city of Carlsbad issued evacuation orders for several neighborhoods east of Aviara Parkway just before 4:30 p.m., though details were not immediately available. By early evening the Carlsbad Unified School District had cancelled classes at all its schools for Thursday and Friday. At about 4:30 the district reported no school structures had been damaged. Evacuation shelters were set up at Calaveras Hills Community Center for residents and pets, and at Westfield Plaza Camino Real for residents and larger animals such as livestock, according to 211 San Diego. La Costa Canyon High School is also open as a shelter for people only, no pets. The blaze broke out for unknown reasons shortly after 10:30 a.m. near Poinsettia Lane and Alicante Road, just east of El Camino Real. Winds quickly pushed the flames west toward neighborhoods and some high-tech businesses. 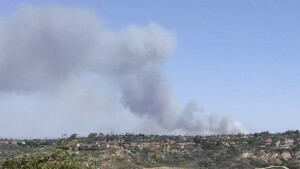 Homes were burning by 12:30 p.m., and reports from the scene also indicated that flames damaged Aviara Community Park. More than 11,600 residences and businesses received “reverse 911” calls urging the occupants to leave, county officials said. An evacuation center was set up at Westfield Plaza Camino Real mall, 2525 El Camino Real. Mohler said firefighters were up against extreme conditions. Among sites evacuated were Aviara Oaks elementary and middle schools, and Poinsettia Elementary, according to Carlsbad Unified School District officials, who stated that students were in no danger. Aviara Oaks students were taken to the Brighton Gardens Senior Center at El Camino Real and Aviara Parkway, while Poinsettia Elementary pupils were transported to Carrillo Elementary School at 2875 Poinsettia Lane in San Marcos. The fire was somewhat close to McClellan-Palomar Airport, but flight operations were not significantly affected, said Ian Gregor, a spokesman for the Federal Aviation Administration. Aircraft were being directed around the smoke, he said. Dove Library, Aviara Community Park and Alga Norte Community Park were closed, and Legoland California was evacuated as a safety precaution because of electrical power surges, officials said. The blaze came amid a heat wave that was pushing temperatures well into the 90s along the coast. Winds, however, were not as strong as on Tuesday, when a wildfire charred nearly 1,600 acres between 4S Ranch and Rancho Santa Fe.